While many of us check our carry guns and equipment religiously, how many check your ammunition? A recent article by Patrick Sweeney discussing “one in a million” ammo accidents got me to thinking: “What have I seen or experienced that has changed the way I handle my ammunition that may benefit another person?” Consider that billions (with a big B) of individual cartridges are produced each year by factories, commercial reloaders, and handloaders. In the training I’m involved with, thousands of rounds are fired and I see things that are not right. 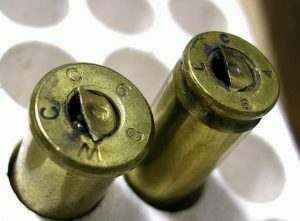 In training, there have been factory-new rounds that had the bullet crimped in backwards, crumpled case walls that prevented chambering and occasional upside down primers. I had a new box of .40 S&W ammo, bought from a large supplier that had one upside down primer right in the middle of the package. It sure did stick out. The suggestion is check that factory out-of-the-box ammo before you load it for any visible flaws. Look to see if the bullet is correctly oriented and firmly crimped. Is the case itself all right? Be sure it is not bulged or crumpled. Is the primer right side up and seated to the correct depth for reliable feeding/firing? I have also seen primers missing or placed sideways during the loading process. If you are using a revolver, check the primer to see that it is even with or slightly below the base of the case to prevent tying up cylinder rotation. In a semi-auto, a high primer could lead to a slam-fire as the slide or bolt moves forward. This is for factory ammo. Remanufactured or reloaded ammo also needs the same checks. When I buy remanufactured cartridges for handgun or rifle, I inspect each, and then drop them into a Wilson check gauge appropriate for the cartridge to see if it will chamber and is not over-length. If you don’t have one for your semi-auto pistol and have a removeable barrel, such as a 1911, Glock, etc., you can use the barrel to see if the round fits the chamber correctly. It should slide in and out without hang-ups. Reloaded ammo starts with cleaning the cases and checking for cracks or other problems. Years ago while firing another person’s reloads in their Colt 1911 .45 ACP, a reloaded round with a small crack let go as it was struck by the firing pin. By let go, I mean, KABOOM! My hands were stinging, the magazine had blown out of the gun to the ground, the slide locked to the rear with the gun smoking. I thought I had done something that caused it. The gun’s owner made sure I was okay and had me check myself in his truck side-view mirror. My safety glasses saved my eyes as there were small pieces of the brass case embedded all over my face with blood leaking from the holes! The Pachmeyer rubber stocks with the steel inserts on the gun saved my hands. That missed crack in the case could have been devastating had safety measures not been in place. Another thing that people who carry semi-autos should be very concerned about is bullet set-back. This is caused by loading the same cartridge over and over again, usually the first one in the magazine. Load and unload it enough, and the crimp will be overcome and the bullet will set back a small distance. In some cartridges such as the .40 S&W, it can spike pressures and cause a huge problem. Law enforcement trainers are aware of this and caution officers to rotate the round being loaded. It can also lead to feeding issues if the round is too short. I also have personally seen the Blazer CCI ammo with aluminum cases have set-back problems is used in polymer magazines like the Glock system. If the bottom few rounds are not fired and you load and shoot without emptying the magazine, the bullets in the bottom rounds will be pushed further into the case. This happened to me at a four day Defensive Handgun class at Front Sight in Nevada. At the end of the course, I have 40-45 individual cartridges that had set back, all of which had been the bottom rounds in the magazines. This is not to say the Blazer ammunition aluminum cases are not to be used, just be aware it can happen. Also, the same ammo in 38 S&W Special can jump the crimp if fired in the lightweight revolvers from various manufacturers. The sharp recoil overcomes the crimp and the bullet slips forward, often enough to prevent cylinder rotation, tying up the gun. 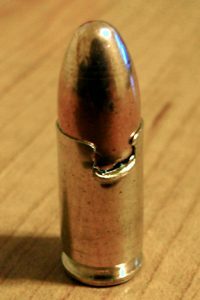 In the three cases that happened in class, I was able to push the bullet back into the case far enough to allow the offending round to be removed. This issue js known by many producers of lightweight revolvers, and the instruction manual will usually note which ammunition should not be used. As the power level increases with revolvers, crimp on the bullet becomes more important. Handloaders know the value of a good roll-crimp on the magnum calibers to prevent bullets from jumping forward under recoil and blocking cylinder rotation. Always check to see if your ammunition matches the marking on your firearm. In two instances, this was not done and problems followed. In the first case, a person was issued ammo to be used for a qualification. During the course of the exercise, the person thought they had experienced a squib when he noted an unusual report and lighter than normal recoil. Upon inspection of his Glock 22 in .40 S&W, no problem was found, but the ejected case told the story: whomever had issued the ammunition had put a single 9mm Luger round in with the .40 S&W’s. The bulged case showed what happened. A 9mm will fire in the .40 chamber, which is a 10mm diameter. Case lengths are the same, so it fed and fired, and in this particular instance, ejected. The second situation was during a rifle instructor course. One participant had an AR-15 in 9mm Luger. In the shooting exercise a strange failure to eject happened. It was cleared and he continued with no further problems. Later that day, the gun’s owner let me know he had inadvertently included a single .357 SIG cartridge. Bullet diameter is the same as the 9mm, but the case it a bottleneck design resembling a .40 S&W. As it turned out, it fit the magazine, but did not fully chamber and fired as the bolt came forward, crushing the case into the chamber. No damage to gun or shooter, however it reminds us to check each round to make sure it is the correct size. While serving as a Hunter Education instructor, often I would have students come to the range qualification with a can or plastic bag full of ammunition. Inside would be .22 long rifle, but also .22 short, .22 long, .22 magnum and even the old .22 Winchester Rimfire. If not watched closely, stoppages occurred when the wrong cartridge was loaded in the chamber or magazine. A check of ammunition before the shooting test prevented most problems, and it became a teaching moment as well. The main point of all of these observations is “check your ammunition”. 100% reliability is needed for self-defense systems. Ammo inspection is part of that. Be grateful to all those who have and are protecting our freedoms and remember them as the Holiday season commences. Life Endowment member NRA - NRA certified instructor since 1994, training counselor and chief range safety officer since 1999 - Utah BCI certified CFP Instructor since 1995 - 20 plus years Utah Hunter Education instructor - Heavily involved with gun rights in the state of Utah - Train armed security/armored car guards and bail enforcement in firearms qualification - Instructed through the Western US.